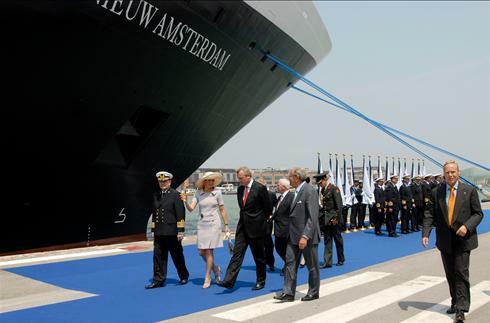 In a fantastic ceremony, filled with Dutch heritage and culture, the new ship from Holland America Cruise Line has been named MS Nieuw Amsterdam. The ship was named in Venice today, with hundreds of people coming out to see the naming ceremony. Her Royal Highness Princess Maxima of the Netherlands officially named the new vessel, which is the 15th ship in the fleet. There were cruise guests, dignitaries and media surrounding the ship throughout the ceremony, before it left for it’s maiden cruise. Fifteen fleet captains attended the festivities, representing all of the ships in the fleet and giving a warm welcome to Her Royal Highness as she arrived for the ceremony. After the ship was blessed, and the traditional bottle of champagne had been broken on the ship’s bow, the crowd gave a huge cheer. The ships was built at Fincantieri’s Marghera ship yard which is near to Venice. It is one of the largest in the fleet and will hold around 2,100 guests. It’s maiden voyage will be to nearby Mediterranean ports, and it will also be offering a series of 12 day Med cruises throughout the summer. After these sailings, the ship is destined for a trans-atlantic crossing to the Caribbean where it will be offering 7 day itineraries in both the Eastern Caribbean and Western Caribbean. These sailings will begin in November 2010.